Spoon rings first gained popularity in the 1970s, but are still made today. In fact, both sterling spoons and fork handles are used to make different types of jewelry, including necklaces and bracelets. 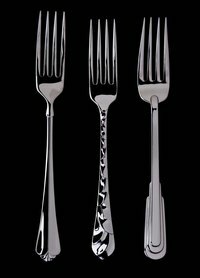 In the process of designing and making jewelry from sterling silver forks, you might have to drill a hole into a silver fork. Drilling a hole into a sterling silver fork is a direct task that does not require a lot of metalworking ability. Open the vise by cranking the handle to the left. Set the fork with the handle sticking straight up out of the vise, and then turn the vise handle to the right until the fork is secured tightly. Attach the 0.5 mm metal drill bit into the drill by opening the chuck collar, seating the bit by hand and then tightening the chuck collar. Place the tip of the drill bit on the spot on the fork handle where you want to drill, and set the drill to the highest speed. Squeeze the drill trigger and guide the bit through the handle until the hole is made. Repeat this process to drill more holes if desired.